Pioneers in the industry, we offer gel sheets from India. Gel Sheets are lightweight, when soaked in clean, potable (drinking quality) water for 15 – 30 minutes or even longer. Warm water may be used, if required, without detriment to the product and will quicken the rate of uptake. Shake off surplus water. Freeze to at least -7 C. For most applications, it is best to freeze at the lowest possible temperature. Gel Sheets maintains a low temperature for twice the length of time compared to gel packs because of its ability to achieve "near total coverage of the product". The products should ideally be packed as close to 0°C as is practical, in insulated packaging, packed at 0°C and wrapped in it maintained a temperature below 8°C for over 24 hours during extreme of Summer. 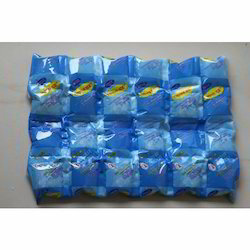 It is made up of special plastic films/cloth sealed to form small cells. When preparing for freezing, take care to stack sheets or lengths of Gel Sheets with the film side down. All sheets should be placed on the film side against the cloth side of the one below. Do not place sheets of cloth against cloth, as they may stick together when frozen. A safe, non-toxic mixture is contained in each cell which, when soaked in water, swells. Gel Sheets is then frozen and used as an ice substitute to maintain the temperature of the chilled product. With the constant support of our highly experienced professionals, we manufacture and supply Gel Sheets that are helpful in preventing the development of pressure joints which might add to injury. The adhesive surface also helps in keeping the gel sheet in place and the reinforcement on the other surface provides strength. The gel absorbs body heat slowly and then quickly dissipates it again thus avoiding overheating of the skin.